Ransomware malware threat has forced somebody for the terrible suicide and once again has marked its history by somebody’s blood. Sad, but it’s True! Joseph Edwards, a 17-year-old schoolboy from Windsor, Berkshire, hanged himself after receiving a bogus email appeared to be from police claiming that he'd been spotted browsing illegal websites and that a fine of 100 pound needed to be paid in order to stop the police from pursuing him. The scam email pushed the well-known Police Ransomware onto the boy’s laptop and also downloaded malware that locked up his system once it was opened. Edwards was an A-level student with Autism, a developmental disability, that likely made him more susceptible to believing the Internet scam mail, supposedly sent from from Cheshire police, was genuine, a coroner heard on Thursday. Edwards was so upset and depressed by the accusation and the extortionate demand that he hanged himself hours after falling victim to the crucial threat. He was found hanged at his family home in Windsor by his mother Jacqueline Edwards, who told the coroner that he probably didn't understand the implications of his actions. "He didn't seem to have any worries known to me. I don't think he really understood," Jacqueline Edwards told the coroner. "Joseph was subjected to a scam on the internet, a threatening, fake police link that was asking for money," his mother said in a statement. "He would have taken it literally because of his autism and he didn't want to upset Georgia [his sister] or me." As far as we all know, a Police ransomware of this type does not encrypt files and usually asks a victim to pay a small fine that last around $200 or €200. It’s normally much easier to remove the threat from infected systems by using dedicated tools specially designed to remove such infections. According to Detective Sergeant Peter Wall, it will be almost impossible to trace the fraudsters behind the 'crude' email, but believe it may have originated outside the UK. This is not first time when Ransomware has become deadly reason to take someone’s life. 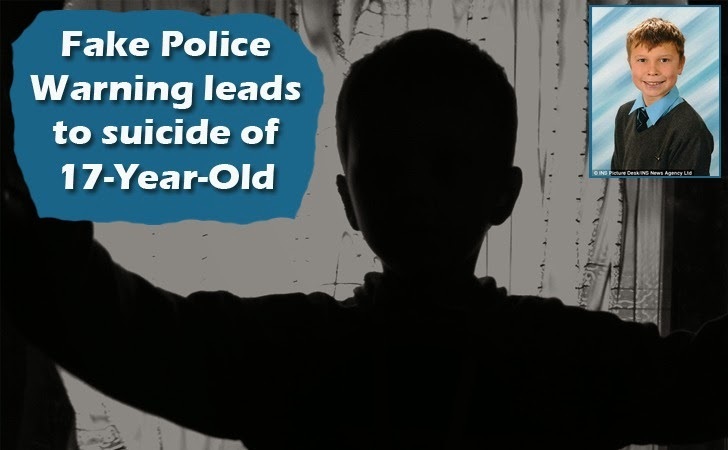 Over a year ago, a Romanian family faced same Police Ransomware threat and the Romanian victim hanged himself and his four-year-old son, scarring that his young son would pay for his mistake and his life would be spend in the moment of delusion. Ransomware is one of the most blatant and obvious criminal's money making schemes out there, from which Cryptolocker threat had touched the peak, and cyber criminals have developed many Cryptolocker versions (prisonlocker, linkup, icepole, cryptobit) by which you have to safeguard your system.